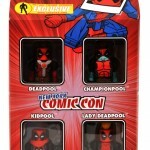 Art Asylum has revealed the packaging for their New York Comic-Con 2011 Exclusive Deadpool Corps Minimates. Why settle for one Deadpool when you can have an entire set of Deadpools? 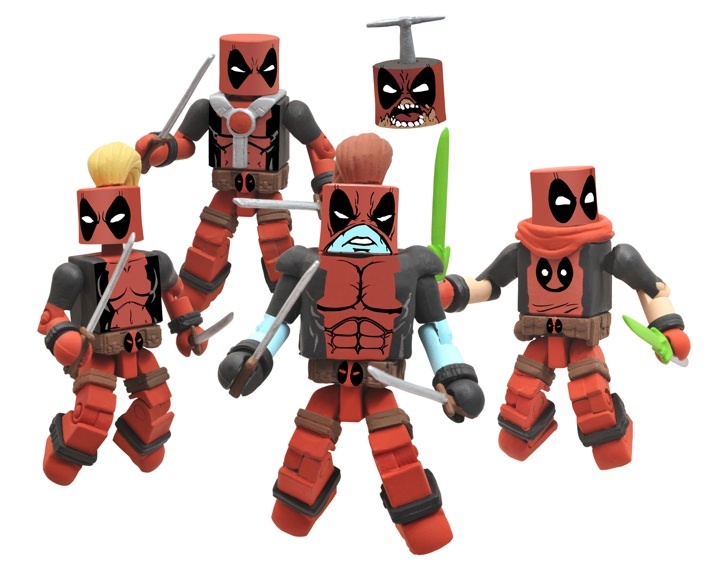 The Deadpool Corps is getting the toy treatment for the first time in history, and it seems fitting that they’re tough-but-cute Marvel Minimates. But if you want the awesome power of the Deadpool Corps in the palm of your hand, there’s only one place to get it: just stop by the Action Figure Express booth (#958) at New York Comic Con on October 13-16, and they’ll hook you up! 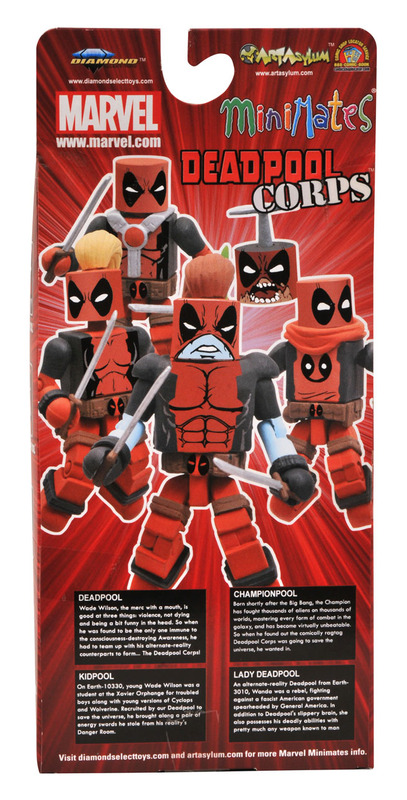 The figures even come in special NYCC-edition Minimates packaging, which Deadpool has customized to feature his own portrait. Check back soon for more NYCC packaging! I'm sold. Ill try to get a few for anyone else that might want a set from here. This is just too tempting. I never managed to get a normal deadpool minimate anyway. I'm not sure I'll bite on this though. No dogpool bugs me about it with how complete it is. All I'd really want anyway is a normal deadpool and maybe ladypool. I might just wait for the MvC3 minimate deadpool and just get that. Still, this is an epic minimates collection! Makes me hope hasbro decides to do a DPC multipack next SDCC or NYCC, maybe even just as a straight up TRU exclusive. I really like the look of this set. Is there anyway to get these other than going to NYCC? I might have to get someone to middleman for me if there isn't. I'd be interested for sure Omega.. as long as they aren't dumb in price. This comic is on again off again good/funny, but the pack makes me want to start reading again! I'd love a set like this, but I think it might not be in the cards for me. Maybe in a trade or something.